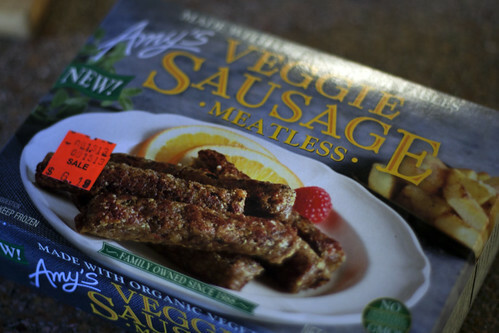 » Product Review: Amy’s Veggie Sausage Don’t Eat Off The Sidewalk! When I transitioned from vegetarian to vegan, I had no problem with letting go of most of the non-vegan things in my house. Some things I finished, some things I gave away. But the three boxes of Boca sausages in my freezer, I had trouble letting go of. Ever since I ate the last one, i’ve been waiting for an eggless version to hit the market. 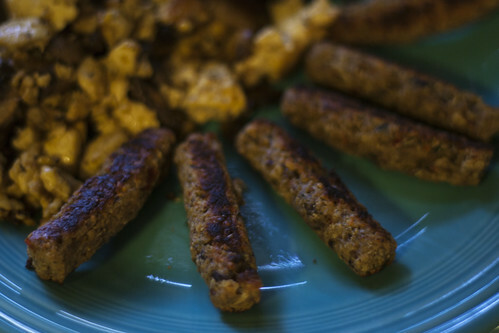 Homemade seitan sausages are great, but they’re not the same thing. I saw this box of Amy’s sausages in the cold case of a health food store and squealed. Was this it? The product I had been waiting for? No, not really. They’re good, if you’ve had their Sonoma burger they’re kind of like that because they’re made out of quinoa, but with sausage-y spices. They’re also smaller than I expected, even for breakfast links. When I opened the package I thought they looked pretty sad and health-foody. They cooked up well, but the ones that were touching had separation anxiety and the ‘skins’ had stuck together. We definitely enjoyed them, but as you can see from the price tag they are pretty pricey. I don’t remember how many sausages there were, but we had them with tofu scramble and had no problems eating the box between the two of us in one meal. If they were a few bucks less i’d be inclined to eat them again, but not at six dollars a box. They might be cheaper in a regular grocery store, but the health food store I bought them from has pretty decent prices so I don’t think they had them exorbitantly marked up. Sometime in the next week I will have a review/giveaway for Kelly’s new book, Cheers To Vegan Sweets, so check back for that!